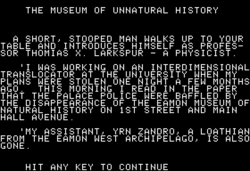 Museum of Unnatural History is an Eamon adventure written by Rick Volberding. The fictional Eamon Museum of Natural History—the setting for the adventure—is devoted to preserving details about Eamon's history. As such, many facts about planet Eamon may be inferred from its artifacts, monsters, and room descriptions. That Eamon faced eras of evolution is made clear in Unnatural History, with wings devoted to its prehistoric life (primarily dinosaurs). With exhibits on Eamon's Stone Age—as well as a cave man as a monster—it is also suggested that the culture and inhabitants of the planet slowly emerged from a primitive population. Moreover, the geography of planet Eamon is adumbrated over the course of the adventure. Three continents of planet Eamon are described—that upon which the Main Hall rests, an "hourglass" continent, and a "horseshoe" continent. The flora and fauna of the former are described as primarily "cute and cuddly" while the morphological features of the flora and fauna of the latter two continents are determined by the shape of the landmass. E.g., creatures on the "horseshoe" continent tend to have "U"-shaped horns growing from their heads. Eamon is also described as having both an east and a west archipelago, and an enormous "floating island" hovering two miles above and to the northeast of the Main Hall's continent. Two bodies of water are also described, the North Ocean—populated with giant sea monsters—and the Silver South Seas, from which much of the silver in Eamon is "netted." Coincidentally, John MacArthur's Journey Across the Muerte Sea also describes Eamon as having three continents, though none in as much geographical detail as found in Unnatural History. The continent in which the Main Hall is found in MacArthur's adventure is called "Grancasa." Voberding's "Main Hall continent" might thus be equated with MacArthur's Grancasa. Professor Thomas X. Larkspur, the physicist who assigns the adventurer the quest in the introduction, plays an important role in the events of A Runcible Cargo, albeit with expanded research interests. The use of the Power spell yields the effect that "a ray of light bores into the museum, kills [the adventurer], and destroys all else" 10% of the time. This page was last edited on 23 April 2019, at 07:26.